A discussion of current information technology and future trends. The content is designed for a broad audience that wants to know what is happening but does not want to spend all their waking hours trying to keep up. There are many sites to find new apps. I only follow iPad and iPhone/iPod so those are the ones I can recommend. Provides detailed reviews of several apps each week. Offers brief comments on numerous apps. There's always a section with apps that are free for a short period - often only one day - so you need to check this one often. Great searching and sorting tools including Apps on Sale and a Watch List you create to watch for apps that go on sale. Numerous other sites including Computerworld, Maclife, PCworld and Datamation. Internet based TV - are you ready to cut the cable or dump the dish? Imagine sitting with a tablet computer such as the iPad on the table or in your lap and doing the following things: 1) Write a blog entry, 2) Use the iPad Remote App to turn on your Apple TV, 3) Then use the same app to select some Christmas music from your PC or MAC to play through the TV, 4) Select photos from your computer library to display on the TV while the music is playing, 4) Continue working on the blog, reading email or the news and checking the weather, sports scores or traffic. You don't need to imagine any longer; that's what I just did while working on this blog post. I've seen the future and it is Internet TV. Both Google and Apple are plunging full speed ahead in this exploding field. This really is the next big thing. 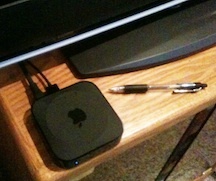 Since the Apple TV is reasonably easy to understand I'll explain how it works. 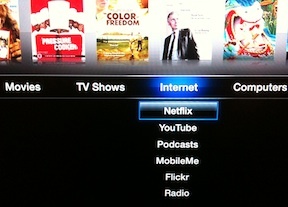 What is the Apple TV? It's a very small computer that comes without a monitor, keyboard or mouse. It costs $99US and requires a $20US cable to connect to the HDMI port on a digital TV. It will not work on old TVs. To use it, you go through a set up process like any new computer - enter settings to add it to your wireless network, access your Netflix account, iTunes account, etc. 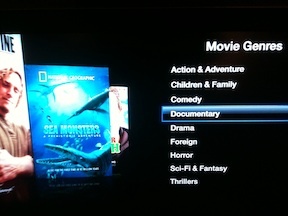 This is all accomplished using the Apple TV remote control. Finding your account passwords may be the most difficult part. Once it's set up, you can use the tiny remote or the Remote App on an iPhone, iPad or iPod Touch to do dozens of incredible things. > Stream music, video and photo shows from any PC or MAC on your network to your TV. Here are a few screen shots to show the simple on screen menu. 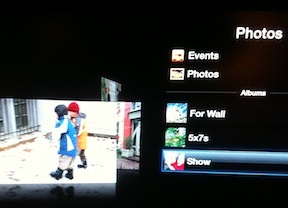 The Apple TV is a general purpose computer that comes with a set of programs (apps) to handle this type of home media application. I'm sure within a year you will be able to download additional apps for other tasks from an Apple TV app store. Starting January 6, 2011 that's one way you will purchase and install software for MAC computers - not just iPads and iPhones. 2010 will be remembered as the year the Mobile Revolution began and 2011 will be the year of The Internet TV thanks to Apple and Google. Buying a mobile phone is a lot more complex than it used to be. If you intend to invest in a smartphone with a long term contract, there are four questions you should answer at the beginning. Are you restricted by current contract, location or desire to a certain carrier or carriers? Will this be your only mobile device or will you also own some type of tablet? Do you want or require a specific operating system - Apple, Android, etc.? Is compatibility with some other device important? Once you answer these questions you will be in a much better position to begin your search and say something more intelligent than "I think I like the blue one". According to this New York Times article Microsoft plans to roll out several new tablets at the Consumer Electronics Show opening January 6th in Las Vegas. Most observers have been disappointed in Microsoft's showing in the mobile area. Their Win Phone was announced, cancelled and then re-announced this summer. Windows Phone 7 OS based phones have had limited success. They have been announcing tablet computers since 2001 so it's not surprising there are skeptics. Most of the debate boils down to which operating systems will win out. With Apple iOS and Android having wide spread adoption, can Microsoft convince people that one of their two operating systems - Windows 7 Mobile or Windows 7 (PC version with touch screen) - can be competitive. We'll know soon. The train has left the station and unfortunately for Microsoft it's high speed rail this time and not the lumbering freight train of the 1980's PC revolution. Apple TV: What's going to be in your stocking? The second generation Apple TV was introduced this summer and gained additional capabilities when the Apple iOS operating system was upgraded. iOS4.2 is the operating system currently used by the iPhone, iPad and iPod. 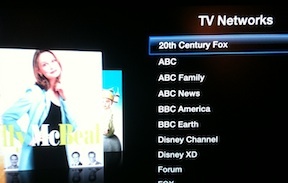 The Apple TV represents Apple's first salvo in the battle with Google and others to control your TV viewing. I will be trying the device soon and will give a further report shortly. In the mean time you can read this review from the generally reliable CNET. Favorite Apps - My Brand New List Is Here! The Twitterverse is full of requests from new iPad users for app suggestions. NOTE: an "app" is just the new name for a program. Since there are over 300,000 apps (programs) available you can see why a newbie might be overwhelmed. I certainly haven't tried them all but I have used over 400 on both the iPad and the iPhone. Remember iPhone apps will work on the iPad; they will just use a small portion of the screen and will resemble the iPhone display. Of course most iPhone apps will also work on the iPod Touch. In many cases a company will provide two versions - one for the iPhone/iPod Touch and one that takes advantage of the large screen on the iPad. Many newspapers do this. So - what do I like? GPS Drive - locating coffee shops, etc. Transfer - to move photos wirelessly between iPad, iPhone and iMac. Bump - moves contact info, calendar dates and other information between Apple and Android devices - by bumping them together - you have to see it to believe it. 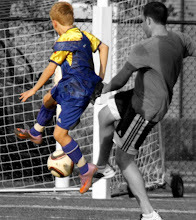 MyConvert - thousands of conversation factors - just fun to try - did you know there were 12,152.23312 cubits in a league! Apps for finding Apps - you'll need these! World Clock - display clocks for numerous locations of your choice. More details are being announced about the new way wireless companies will charge for your cell phone data plans. Tiered pricing is the general time for charging you by the speed of the service you choose and/or the amount of data you consume (download). The plans are likely to be horrendously complicated and a spike in monthly bills could be the first indication of what is happening. This Washington Post article provides some information about the subject. The trend will accelerate as companies roll out fourth generation (4G) services late this year and into 2011. In case you thought you'd heard of every dire threat to your computer, here's one more to add to your list of things to worry about - ransomeware. This recent Computer World article describes malware that can get into your Windows PC through Adobe PDF files. It will search your computer for various files - Word, Excel, etc. and then makes them unreadable. A message will be displayed demanding $120 to restore the files. This trick has been around for several years but two new recent versions may indicate the threat is coming back. As with many other computer "dangers", this reinforces the need to keep software up to date and to perform regular backups. IT developer, consultant, educator and writer.